But we’ll have to save that for another post because today is Friday and that means I need to post this week’s French Fridays with Dorie recipe, Chicken Basquaise. Basquaise, as it turns out, means a whole lotta peppers. Did you know that? I didn’t know that. Not sure where I’ve been, but apparently it hasn’t been to Basque Country. I’m not gonna lie, I was pretty skeptical about this recipe, primarily because my usually easy-going husband’s lips clamp shut at the mere hint of bell peppers. I resigned myself early on to the fact that I would probably be eating alone this week. Oh well, I wouldn’t be the first Dorista to encounter this particular problem. But wouldn’t ya know it, Dorie has gone and seduced my husband. When I try to cook with bell peppers he turns his little nose up, but when Dorie suggests cooking with bell peppers (lots and lots of bell peppers), he actually deigns to try it. AND he even liked it! How do you like that? So in short (if that’s even possible this far into my post) this one was a surprise hit in my house. My husband went back for seconds and I agreed that it was quite tasty. It did take an awfully long time to get on the table and ranks among the less photogenic recipe in the book. But all in all, quite a tasty dinner. It looks like the polenta was very happy soaking up the juices from the chicken. I can’t wait to see some pics from your trip! Hopefully life settles back down and you catch up on work soon. I was surprised by this recipe, too. It tasted much better than it sounded. I love the rhythm of your writing. My husband is pretty open to Dorie’s recipes too… funny I’ve heard a lot of anti-bell pepper comments I didn’t know they were that unpopular. Did you serve the chicken with polenta? Vacations are meant to be enjoyed and food is one of the most enjoyable moments of the day! And the chicken it´s all about the taste after all. Have a great weekend! Happy that you had such a great trip! Can’t wait to read more. Very nice that your husband liked it. I thought it was good too. It would be great served with polenta -looks yummy! patience peeling those peppers, you would have had a good laugh if you heard all the complaining. Have a wonderful weekend. 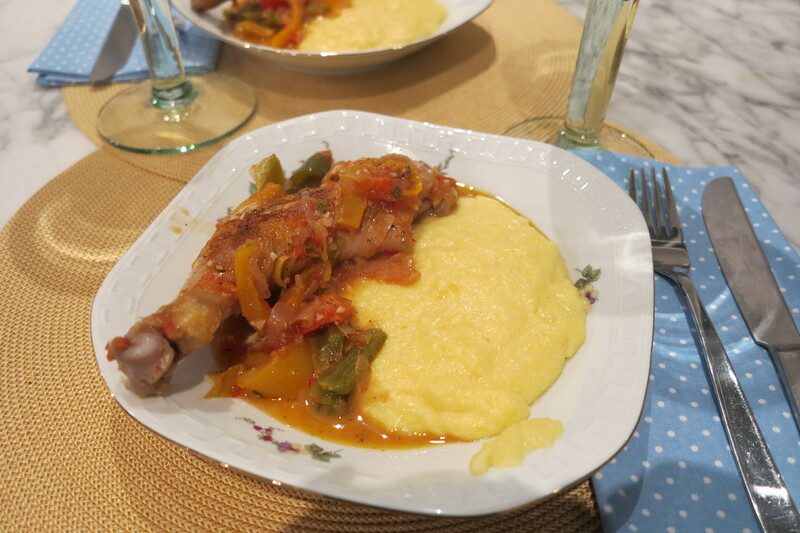 Your chicken looks great – and I’ll bet it was with Polenta! Looking forward to hearing more about your vacation. Good thing it’s te weekend so you can rest! I’m glad you took a stab at it! Looks great! I think the long cooking time really transforms all the ingredients. It’s nice when you can find a recipe that turns a disliked ingredient into a star. Rose, nice to see that you are back! Hope you had a wonderful time despite all the stress that holidays can create – I am sure it was an amazing trip. I agree with you, this was a wonderful dish but not very photogenic. Yours looks just delicious with the polenta on the side! Have a (not too stressful) weekend! I agree – not photogenic, but delicious. Polenta was a great alternative to rice. I’ll try that next time…and there will be a next time! Vacations ARE wonderful, even if getting ready and catching up are hard! I’m high fiving you from across the pond as BOTH our hubbies liked this one 🙂 Hope you’re having a great weekend! I can’t wait to hear about your trip. I’m glad you had a great time. I loved discovering this peppery dish. What is it about other people’s suggestions that make the husbands listen when they won’t listen to us say the same thing? In any case, glad that it was a winner for both of you. What an incredible sounding trip! Australia feels like such a long way away from the rest of the world!!! Your dish looks great and my whole family liked this one too! I’m excited for your post about your trip. It sounds incredible! Too funny about your husband. Mine is the same way. He’ll try all kinds of things “for the blog” that he’d never try if I just made them on my own. Glad you both liked this one.